I went down to Bugis Essensuals the other day to colour my hair again! I don't know if you guys noticed, but my dark hair roots were seriously starting to grow out. 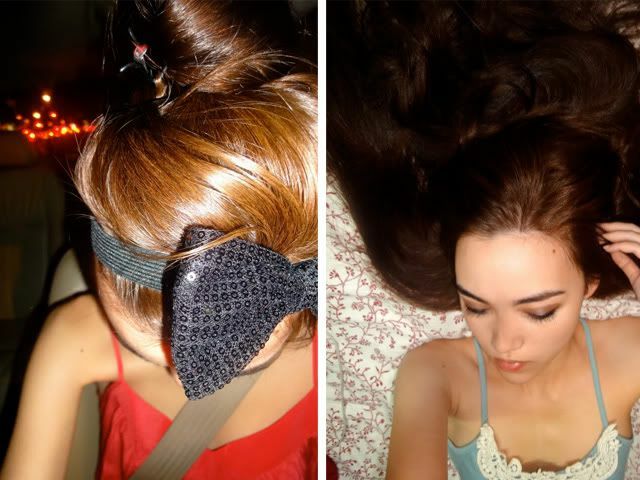 1) My hair is naturally a dark brown, with the brown-ness only showing up under light. 2) I DIY-ed my hair sometime last year. I was just bored of my hair colour so I bought a box of hair dye. Based on advice of "the colour will come out darker than that on the box because your hair is so dark now", I got a medium-ish brown. I certainly wouldn't call it light brown, but basically I hoped it would be visible brown (refer to #1). Anyway... it did turn out like that on the box, so basically it was too light. To put it nicely would be to say it was copper-coloured. To put it bluntly I could call it orange. Actually it looks pretty acceptable without flash (right) but with... (left). 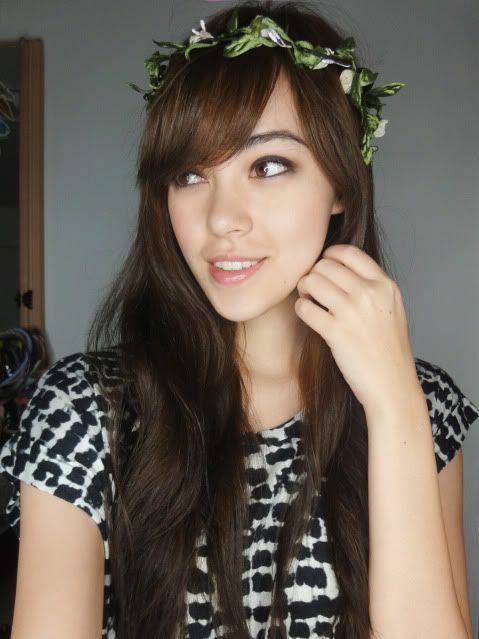 3) With Bugis Essensuals I had my hair dyed a darker brown. I've still been hopping around with the shades of brown! Eventually planning to get a brown that tapers down back to my original hair colour. You can ask Bugis Essensuals about any random hair woes (how soon can I swim after rebonding my hair?) (does short hair suit a round face?) as well as the services they offer at their Formspring! They don't charge by length like most salons do, but instead they charge by the level of expertise of the stylist you pick! P.S. My hair is naturally wavy! You can probably easily achieve this just by bunning up your hair for a short while. Haha I remember deliberating about this flower headring thing in London, asking my friend if I should get it (it was 4pounds I think, which is not cheap at all by Singaporean standards). She said that if she saw me walking down the street with this she would think I'm retarded. I bought it anyway. I sometimes get questions from girls asking what to do with their hair for school/what I did with mine, so I took photos! Ribbons like these can easily be bought from stores like Paperchase or Spotlight, where they sell ribbons by the metre. I usually do this when I have PE or CCA that day (I was in Rhythmic Gymnastics) because it keeps my hair away from my face. When it's really hot I can just incorporate my fringe into my braid as well, and generally you don't even need pins. P.P.S. Please don't ask me HOW to do a French braid! 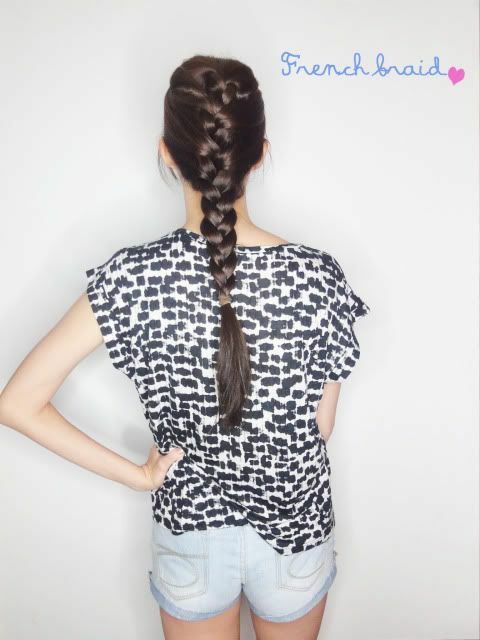 It's really very simple if you know how to do a normal braid. It was self-taught for me. Lol. Just if I'm feeling slightly more "adventurous" with my hair that day. 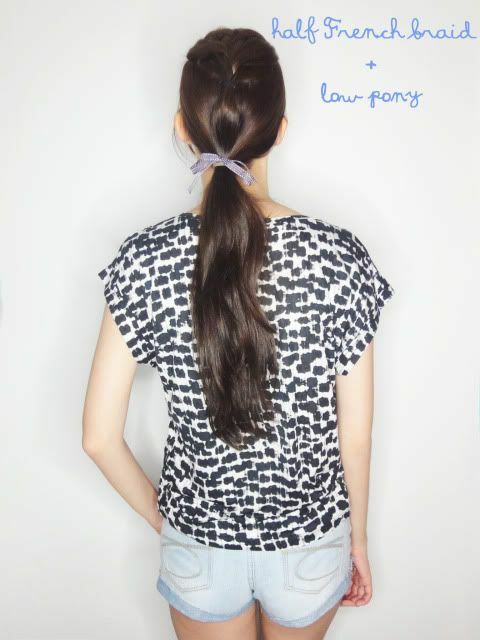 Did this quite often until my favourite rubberband broke ): In JC2 I tended to just do the Low pony almost every day haha. Lazy liao. And here's your generic normal high ponytail! I very, very rarely used this in JC because my hair is pretty long and thick, so this seriously hurts and tugs on my scalp especially considering how long school days can be. So there you have it! I actually first started doing the French braid in Sec3 when I was 15 years old, and everyone laughed at me lor... say look like farmgirl, Dutch milk girl etc. Haha but I think now girls are more adventurous with their hairstyles. Fewer are sticking to just the ponytail. But then again it's been so long since I've been in a uniform :D In NUS most girls just let their hair down! I also don't know how strict the various schools are with respect to hair accessories, SAJC is pretty lax about such things. 15 comments on "My Hair"
how is the weather like in genting? :)very cold? Anonymous: Nah quite ok! But I suppose jeans or leggings would be better, when I wore shorts then yes I was quite cold. You should definitely bring along a sweater as well! hey, can u give details on how to make a hair bun? your bun looks nice!I have been trying out for ages but failed :x Thanks! sophie,bugis essensuals do charge by length! the other time i went there to dye my hair, they charged me 40 bucks extra cos they said my hair was long(arnd the same length as your hair). I demand more frequent updates to your life. Anonymous: Haha I know the concept of a fish braid, but I never really bothered trying. Doesn't look that hard leh! C: Haha gosh spot on! The stylist mentioned that he'd go for an ashier brown this time. I can't even tell the difference between all the types of browns lol. Anonymous: Haha really no details/special method leh! I just twist it around, tie it and secure it with pins! But maybe I'll try to do a vid sometime. Jace: Haha global warming? The air INSIDE Genting is soooo bad because of all the smokers. I can literally feel my skin dying. What do you mean by "Then I saw other girls in St Margaret's starting to sprout braids/French braids... ~pui~" Please mind your words. Anonymous: I mean exactly what I said. Were you from my year in St Margs and would like to prove me otherwise? You must also be the only one taking my words so seriously. Your hair is so gorgeous and shiny! Also, I love the high pony on you! BTW, does your hair have layers?? Light Love: Haha took me quite a while of non-cutting! Yeah I should think it's a little bit layered at least!